The following list contains official BlackArch live and netinstall ISO images. You can burn these images to DVDs and flashdrives. The live ISO contains a complete, functional BlackArch Linux system. The netinstall ISO is a lightweight image for bootstrapping machines.If possible, please try to use a mirror near you to download the ISOs. You can find a list of mirrors below. The following list contains official BlackArch (x86_64) OVA images. You can run these images in Virtualbox, VMware and QEMU.If possible, please try to use a mirror near you to download the OVA images. You can find a list of mirrors below. 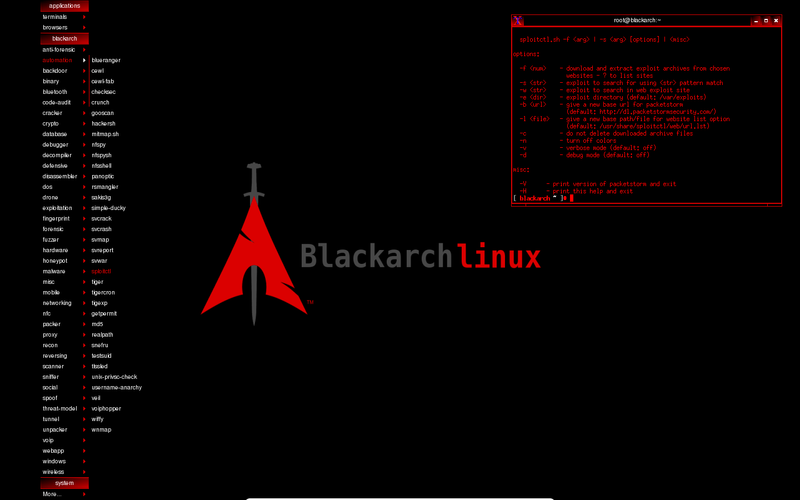 BlackArch Linux is compatible with existing/normal Arch installations. It acts as an unofficial user repository. Below you will find instructions on how to install BlackArch in this manner. # Run https://blackarch.org/strap.sh as root and follow the instructions. You may now install tools from the blackarch repository. As part of an alternative method of installation, you can build the blackarch packages from source. You can find the PKGBUILDs on github. To build the entire repo, you can use the blackman tool. The complete tool list of the BlackArch Linux repository can be found here. You can install BlackArch Linux (packages AND environment) using the Live or Netinstall medium. If you need to be guided step by step, please consult the blackarch install tutorial. BlackArch is compatible with Arch Linux ARM. It effectively supports all of the ARMv6, ARMv7 and Aarch64 platforms listed here.In order to install BlackArch on an ARM platform, follow the install instructions for your device on archlinuxarm.org and install BlackArch as an unofficial user repository. Soon we will release adaptations of the Arch Linux ARM images with BlackArch packages pre-installed.